The Gravity Project, led by Paul Grabowsky and Rob Burke, is a nine-piece ensemble presenting a contemporary cultural prism of musical experimentation in composition and improvisation. Artistically, the overarching aim for the Gravity Project is to create a transcultural musical dialogue through a carefully structured collaboration of Japanese musicians (who are leaders in the performance of traditional Japanese music and a rapper), performing with Australian improvising and electronic focused musicians playing original music of the now. 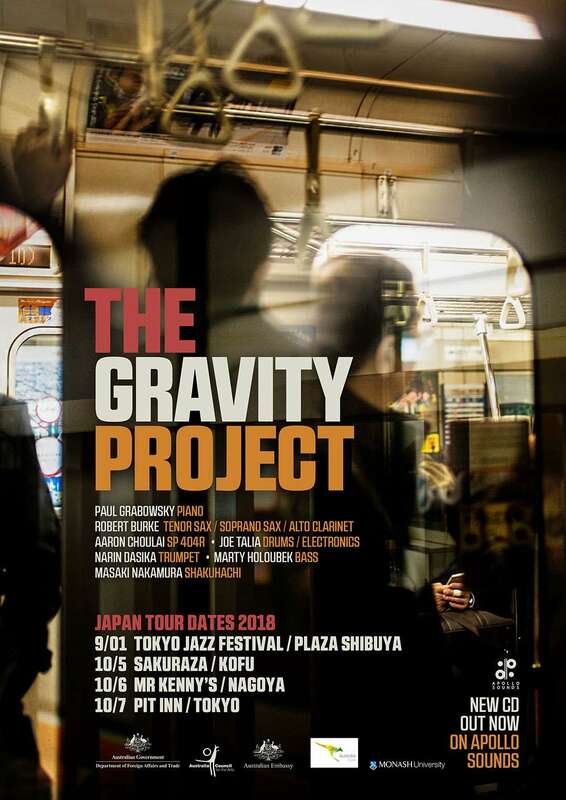 Growing from concerts in both Australia and Japan, the Gravity Project was developed in 2017, firstly in composition by Paul Grabowsky and then documented in a recording session in Tokyo. The recording was further developed through the addition of hip-hop beats, and a detailed re-structure and deconstruction through editing and mixing (Aaron Choulai and Joe Talia). The foundation of the performances (compositions) is informed by the performance of the Shakuhachi and Koto through the Fuke tradition of Zen music and the gestural influence in Noh Theatre. At the heart of the music making is experimentation and the exploration of potential possibilities through the creation of a sonic ecology: elite performers from diverse backgrounds, improvising, interacting, and discovering sounds both inside and outside their area of expertise and cultural habitat. With the freedom to question their respective musical identities within a structured and artistically sophisticated framework, the musicians produce a combination of musical styles and sounds which creates a unique musical experience for the listener, contributing to the development of an Australian and Japanese musical identity in the 21st century. Gravity is the ultimate force of attraction, bringing all things with energy together. In the Gravity Project, music works as a gravitational force, bringing gesture, language and tradition into dialectical relationships of conflict and resolution. Compositions create spaces for improvised dialogue, interplay and gestural intersection; cultural hierarchies are subverted and reconsidered. The musical references range across time and space, drawn together by the trust, urgency and delight in the moment: the hallmark of improvised music.